Tuscany, Italy, first half of 15th cent. Gift of Janos Scholz, 1984. Richard Eyre; A.H. Raynolds, New York; Philip Duschnes, New York. Ms. written and decorated in Italy, possibly Tuscany, first half of 15th century. Texts: Cato maior de senectute, Paradoxa, Pro Marcello. 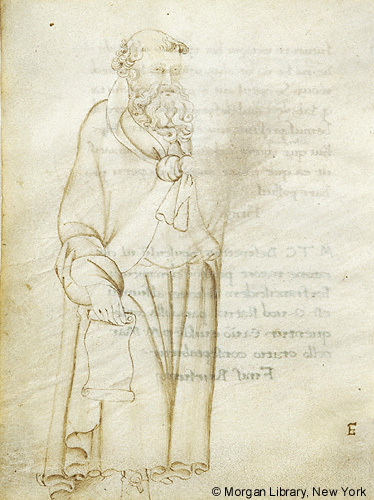 Scribe: Domenico di Ser Francesco. Decoration: 1 pen drawing (later addition? ), 2 penwork initials, 1 miniature (fol. 38v). NB: fol. 38, which had been detached from the codex, was reinserted February 2016. Contemporary goatskin over wooden boards, rebacked.